A short speech about one of the first participants in a workshop run by the Porirua City Council IT Educational Trust whom I mentored. Some people make a lasting impression on our lives. For me, such a person was Agnes. As funds came pouring in, all sorts of things became possible. Agnes was on the very first training class in April 2002. She was fiercely determined that her great nephew, Leo, would do well in school. If he was learning to use computers, then she would too. I asked if I could be Agnes’s mentor. She attracted me because she was on crutches following a recent total knee replacement and I was about to undergo the same operation. I thought she might be able to give me some tips. I sat beside her throughout the ten-week course. My impression of her was that she was over 60, quiet, unprepossessing, totally computer illiterate and very, very brave. Despite her physical discomfort, she never missed a lesson. I watched Agnes as she searched for the elusive ‘on’ button. She looked at me for confirmation when she found it, and pressed. ‘Beep’ and the screen flashed. Agnes nearly jumped out of her chair. She was terrified! I quickly realised that this was going to be a baptism of fire for her – and for the many other families all around us. Agnes completed her ten-week course and immediately asked if she could sign up for a second ten weeks – ‘just to make sure that it had sunk in’. One day, some months after her training was complete, I called on Agnes at her home in Porirua East. ‘Come in, come in’, she said, ‘and look at what I’ve found. I’ve been tracing my genealogy. Some of my ancestors came from Ireland’. She could hardly contain her excitement. In her wildest dreams she had never imagined the extent to which her world would open up. She had never sought to travel far afield from her home in Porirua East. Now she could explore the whole universe through the internet. The next time I rang Agnes, she was so excited I could have sworn that she was ‘flying’. Through searching the web for her genealogy, Agnes had found out about a forest in Hawkes Bay that was owned by her family. She heard that the Trust Board were looking for a new trustee. She said that several people in her tribe - Ngati Hineuru - had encouraged her to put her name forward. Agnes said ‘choose me’. And they did! She said there was a whole lot of learning involved with being a Trustee! She told me that she had just come back from Hawke’s Bay where she attended fortnightly hui to plan what to do with the Forest owned by the Tatarākina Trust. She said she was so keen, she had even driven herself up to the meeting the last time. No mean feat to tackle the four-hour journey on her own. As well as having had a total knee replacement, Agnes was on the list to have a cataract operation. Agnes loves history. I can sit at her feet for hours and listen to the stories she tells. Through what she has gleaned from the web, she can now point out to her whakapapa the historical places that her Tipuna, her ancestors, lived on. She finds it hard to describe what it means to walk in their footsteps. Sometimes she is taken up in a helicopter to see the forest from above so that she can point out where the wahi tapu is. One of her jobs on the Trust is to make sure that the wahi tapu, the sacred land of her ancestors, isn’t desecrated when the bulldozers go in and the trees are cut down. Agnes tells me that without the benefit of the eLearning scheme, this door might never have opened for her. Without access to the internet, she might never have discovered the information that means so much to her now. 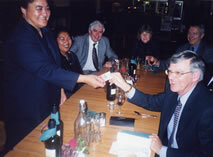 When Graham Kelly was about to leave for Canada in 2003 to take up his position as High Commissioner, the e-Learning Trustees decided to give him a farewell dinner. I rang Agnes the day before. ‘What are you doing tomorrow evening’, I asked. ‘I’ve got a church meeting’, she said, ‘why?’ ‘Can you miss it’, I asked, ‘I want to take you out to dinner’. When I explained the reason for the celebration, Agnes responded as a typical woman. ‘I haven’t got anything to wear’, she said. So we agreed that we would dress alike, in sweaters and slacks. Trouble was, Agnes managed to score a formal suit for the occasion! As the evening progressed I asked Agnes quietly how she would feel about telling Graham what the eLearning opportunity had meant to her. She gladly agreed – something she couldn’t possibly have done just a short time before. She stood to speak and we all waited in hushed silence. What she said and the way she said it brought tears of joy to Graham’s eyes – his dream had come true in the form of this outstanding and inspiring woman. At the end of her speech, Agnes reached into her pocket and, delving in, brought something out. She reached across the table and proudly presented Graham with … her business card! Agnes has been, and remains, an inspiration to me. She showed such courage, such determination, such commitment – all without having the slightest idea what lay ahead of her. She put up her hand to join the scheme, sat through 20 weeks of training, searched for and found her roots, became a Tatakākina Trustee, and continues to make a huge difference to her whakapapa. Agnes has made a lasting impression on my life. If I need courage to approach some task or other that might take me out of my comfort zone, I think of her. And I suspect that I am not the only person she has inspired. She told me recently that her great nephew, Leo, started medical school in 2005. Original generation time 8.5576 seconds.